Famous for decades among the safari cognoscenti, Botswana is a unique tourist destination and a land of harsh contrasts yet compelling beauty. Heralded as a model of democracy in Africa and very peaceful, it is sometimes referred to as the Switzerland of Africa. The most famous area of Botswana is without any doubt the Okavango Delta, listed as a ‘Wetland of International Importance’ in 1997 by the Ramsar Protocol on Wetlands. The Okavango River which makes the delta originates in the uplands of Angola to the north-west, flows into and then spreads over the sandy spaces of the Kalahari to form an immense and wondrous inland oasis of lagoons, channels, palm-fringed islands and fertile floodplain. The varied habitats attract an incredibly diverse range of fauna & flora. Moremi Game Reserve is the only proclaimed wildlife reserve in the Okavango Delta, covering 20 percent of the total area. 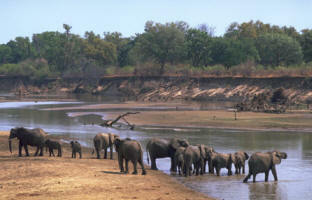 A scenic area with diverse habitats, Moremi offers an excellent year-round wildlife experience. Characterised by a combination of floodplain and the lush indigenous forests of the delta and its islands, Moremi is rich in game and bird life. Much of the remainder of the Okavango Delta is protected by Private Wildlife Reserves, referred to as “concessions”. Each concession will only contain a couple of small and private safari camps. With a typical concession area of 1,000 square kilometres of untamed wilderness, the camps provide a highly exclusive game viewing experience. None of the concession areas are fenced, so the game is able to move across vast expanses of northern Botswana at will, migrating into and out of the concessions and the national parks. The private reserves offer considerable advantages over national parks, with the avoidance of crowds enabling a greater feeling of remoteness and isolation. Many of the private reserves also allow some off-road driving, night drives and walking safaris – activities that are not permitted in the national parks. Rare animals like rhino and cape hunting dogs exist here. To the north-east of the Okavango Delta lies the private Linyanti Wildlife Reserve, along with the Selinda and Kwando Concessions. These remote and pristine wildlife areas are renowned for predators and large concentrations of game, particularly elephant. Chobe National Park, Botswana’s second largest park is arguably the country’s finest destination for game viewing, particularly on the Chobe riverfront and in the Savuti marsh area. Famous for its impressive numbers of elephant, with arguable the largest continuous elephant population on earth, Chobe also boasts one of the greatest concentrations of game on the African continent. The Central Kalahari Game Reserve, the second largest reserve in the world, contains stunning landscapes ranging from vast open plains to undulating sand dunes, from ancient riverbeds to dry saltpans. The reserve is surprisingly rich in flora and fauna, particularly during the rainy season from December to April, when the valleys and pans become home to an abundance of migrating animals and birds. The striking vistas of the fossilised lakes of the Makgadikgadi Pans National Park and Nxai Pan National Park are accompanied by an atmosphere of intense solitude and remoteness. The transformation during the rainy season is remarkable as the pans come to life with frantically feeding water birds and great herds of game. Another area renowned for its rugged wilderness and fascinating topography is the picturesque and diverse Tuli Block, including the Mashatu Game Reserve. Home to stone-age sites of archaeological interest including unique San rock art and the stone ruins of “Solomon’s Wall”, Tuli Block is situated in the far south-eastern corner of Botswana. The striking landscape is characterised by rocky outcrops, large rivers and dry riverbeds. An abundance of wildlife and a profusion of birds ensures that this area ranks amongst the top destinations in Botswana. Also of great archaeological interest is the spiritual Tsodilo Hills, in the dry and desert-like landscape of the north-western Kalahari, one of the most historically significant rock art sites in the world. Botswana offers a truly unique African experience. From the lush green of the Okavango Delta in the north to the red desert dunes in the south, almost 20 percent of the country is reserved for wildlife, allowing visitors to experience nature at its very best. Haha. I woke up down today. Youve cehered me up! What about mentioning some chill-out coastal areas for when you have finished your safari? Such as Zanzibar for Tanzania, and Mombasa for Kenya? That’s a mold-breaker. Great tinhknig! At last! Someone who understands! Thanks for posnitg! Your next article on safaris should focus on Tanzania – it is surely the ULTIMATE destination to visit for a wildlife tour.